The Rogue River flows from Boundary Springs below Crater Lake, through the Wild and Scenic section below Grants Pass to Gold Beach, where it empties into the Pacific Ocean. Major tributaries to the Rogue River include Bear Creek, Little Butte Creek, Evans Creek, the Applegate River, and the Illinois River. Communities located on the banks of the Rogue River include Shady Cove, Gold Hill, Rogue River, Grants Pass, and Gold Beach. Bear Creek in Jackson County, Oregon begins in the Siskiyou and Cascade Mountain Ranges and flows northwest through the towns of Ashland, Talent, Phoenix, Medford, and Central Point. Jacksonville is also within the boundaries of the Bear Creek watershed, being located on Jackson Creek, a tributary of Bear Creek. 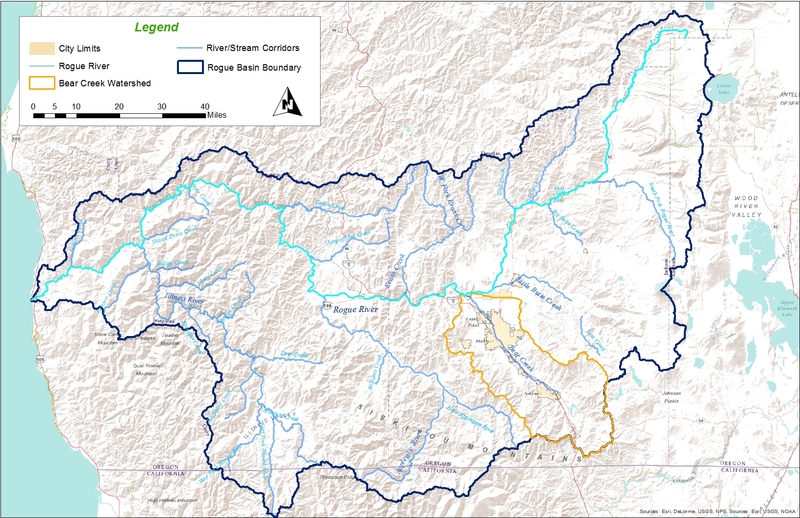 The Bear Creek watershed is part of the Rogue River watershed as the mouth of Bear Creek empties into the Rogue River approximately 5 miles northwest of Central Point. Coho and Chinook salmon, and Steelhead trout live in the Bear Creek watershed, and being Stream Smart helps maintain Bear Creek as viable fish habitat.